reproduction: 4 to 23 ovoid thin-shelled eggs laid in early summer months. Eggs incubate about 45 days. did you know? 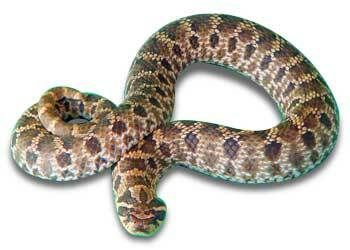 The hognose snake has an elaborate act to play dead when threatened by a predator. These snakes will twist their bodies as if in extreme pain, regurgitate recently eaten food, hang their tongues out of their mouths and even bleed. 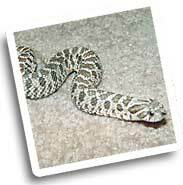 Linda's Western Hognose is named "Hiss" because of his "sunny" "HISSposition." Hiss is more bark than bite, though, and his pugnacious attitude thrills an audience.